Kurate International is using TFWA World Exhibition (Green Village, H44) as a launch-pad for a boosted portfolio of travel inspired jewellery products. The new collection from the Belle & Beau brand is adeptly named Bon Voyage and has been designed to be the ideal travel companion. The Bon Voyage collection is a range of stylish luggage tags that comes with a choice of pocket-size pendants from everyday travel essential styles to tropical trends. With a choice including whimsical flamingos, starfish, delicate daisies or feathers there is a style suitable for everyone. “Travel inspired jewellery is a popular trend at the moment. Anything that reminds travellers of their holidays, looks good with a variety of outfits, or brings back memories is going to hit the right spot. 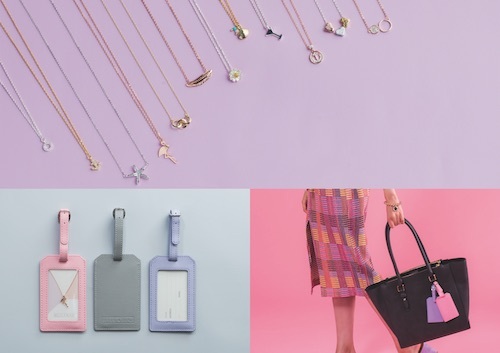 We love introducing unique jewellery items and this new collection is definitely that,” says Claire O’Donnell, Key Account Manager for Kurate International. Each luggage tag comes in soft pink, lilac or dove grey to mirror the Belle & Beau colours and packaging. The pendants are attached to a card insert on which travellers can write their details to ensure their luggage is easily spotted and less likely to be lost. The extra slim packaging means the collection can easily be hung on a display unit making them ideal for ground, airport and cruise/ferry stores – as well as inflight. Kurate will also be showcasing another new addition to its Belle & Beau brand – the Ravenna collection. A range of colourful mosaics and geometric shapes make up the collection. Featuring on-trend turquoise and marbled white stones, combined with brushed rose gold and silver, this collection is a summer must have!